San Francisco, California-based InboxQ (www.InboxQ.com) is a web browser extension – and a “social lead generation” startup of the same name – that sends a real-time stream of Twitter questions related to specific subject – a business, brand, product or point of interest – directly to your browser. Available on Chrome and Firefox, InboxQ makes it easier for you to monitor and answer directly from your Twitter account. It’s a good way for a business to engage consumers in conversations, help solve customer problems and build online engagement. Once installed, you can create a “Campaign” using keywords, phrases or other terms – like brand or product names, for example – that define your search parameters. Relevant tweets are then routed to your inbox for action. 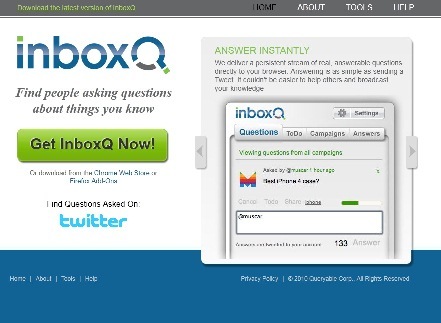 InboxQ – founded in 2009 – plans to expand their service beyond Twitter, with a goal to one day mining questions from every major social network on the web. They are also developing software that will go beyond keywords to anticipate topics relevant to a business. InboxQ is funded by Y Combinator, SoftTechVC, Lowercase Capital, Trinity Ventures and others.